> Having a lowered ride: Cool or uncool? Having a lowered ride: Cool or uncool? 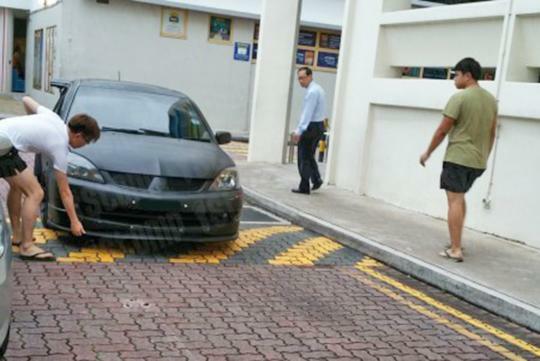 According to Stomp, a Singapore-based online journalism web portal where readers are encouraged to contribute interesting news, a lowered Mitsubishi Lancer was seen needing help crossing a speed bump near Gek Poh Shopping Centre in Jurong West. As reported from the website, the male passenger had to alight from the Lancer and manually lift its front lip while the driver cautiously drove pass the speed hump. While yours truly here loves lowered cars and can understand why some owners want to make their cars extremely low, this might be a little bit too much. What do you readers think of this? Are the comments on the website too harsh? Do let us know in the comments below! What is the point make the car so low like a F-1 car. ?While running around S'pore poor road surfaces. The driver could have overcome the hump without any help by driving diagionally over it. Function > Form. Not the other way around. This hump in the picture already looks very mild by Singapore standards. Wah lao eh! This kind of bumper considered low ah? You have not seen some of the cars in the states where some of the ricers slam their car until they're less than 1 cm from the ground. This type of bumper can clear the hump la. Cannot see the T-shirt clearly. Does it say "I paid to look like an idiot"? The lower the better, cos they scared zaogeng. He must be busy lifting his car's bumper, everyday. Pity. He should tell HDB & LTA,remove all the road humps in S'pore.